With the Rossi Relays less than three weeks away, the Track and Field team is looking to make their mark this season by coming out of the gate strong. This Division II athletic program is fairly new to CSUSB being just its third year, yet features some terrific athletes. Just last year, second year runner Sinclair Watson was one of the fastest freshmen in the conference, placing seventh in the 100 meter dash at the CCAA last year with a time of 12.48. She also ran a personal best at Point Loma which was in the 200 meter at 25.08. “It was pretty good to be a freshman and make top ten,” said Watson. “It was a learning experience even though I didn’t get first,” continued Watson. There’s also talent coming from the field side of the program as well, like Simone Everett who was a transfer from Palomar College. “Our thrower Simone is one of the top throwers in the conference, so we do have some talent here,” said Coach Tom Burleson. Burleson is the cross country coach and has been coaching track & field since the program started, doing his best with the little resources given. Since practice is held on a dirt track, and field training is done on an uneven field, it has been hard on the athletes and coaches especially with fluctuating weather. “If the weather remains nice people will feel more prepared, but because of the weather no one feels ready yet,” said senior runner Yanitza Padfield. 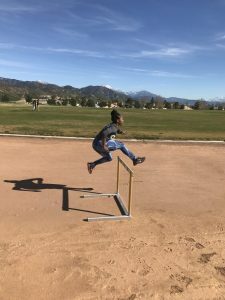 “We don’t get to do the technique work we need to do outside, and we can’t get our marks on a runway for jumping events or pole vault,” continued Padfield. Though these obstacles test the athletes on a day-to-day basis, new assistant track and field coach Lauren Reimer is looking to change the face of the program for good. 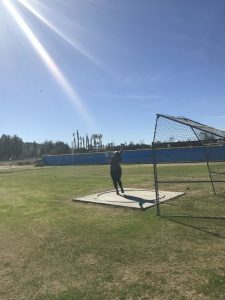 She is an experienced Division I, II and high school coach with experiences from schools like Cal Poly Pomona and Wake Forest University in North Carolina. She graduated from Long Beach State and from 2001-2004 she competed at Georgia Tech, earning a decorated track record like her two All-ACC honors. “We actually all really like her work ethic […] she’s organized and trying to work with everyone’s schedule,” explained Padfield. “She is honest about our workouts […] making sure that we understand that this is a collegiate sport and the discipline in it,” continued Padfield. Burleson has given Reimer the go-ahead to be in full control of workouts and dietary advice. He asks for nothing more from the team than to respect her decisions and listen to instruction. “All I ask is that they give me their full 100% effort at practice and at track meets,” said Reimer. “We are a team and not just individuals […] everyone is stretching and warming up together while the captains spend time with the new runners,” continued Reimer. This team features strong leadership from the experienced athletes like Padfield and other students since most girls in the group are inexperienced. “I’ve been running track since I was in high school […] most of these girls didn’t really run while they were in high school,” said Watson. The captains expectations on this team are high but can be managed if they put in the hard work. “Barely anyone is on a scholarship and a lot of us are here by choice […] my expectation is you’re going to work your hardest at practice and not cut corners,” added Padfield. With the Rossi Relays approaching, the athletes are looking to try their hardest while using this event as an indicator of where they’re at and what they need to improve on. “It should be fun and it’s always been fun […] a lot of the girls improve on their times from this meet,” said hurdler Trisha Toyotome. Longevity-wise, the team is looking to improve from last year from times and placing to overall work ethic. “I think if everyone is serious about the training and keeping up with the work, people are going to be getting a lot of personal bests,” said Padfield. The Rossi Relays are set for Feb. 25 at the Claremont Colleges. The team is looking for an enormous amount of support from the school this season since they intend to accomplish great feats that have not been reached in the program’s history. Who is responsible for underemployment?